Walking across the Golden Gate Bridge in San Francisco brought several reminders as crossed the strait that divides the two sides of what is a very tiny looking area of California on a map. First, as is the case with many monumental natural and man-made structures, I thought of my place in the universe—how small I really am. Second, in the wake of the ethic nationalistic fervor that has sprung up with the advent of Trump’s campaign, I was pleasantly met with surprising diversity. Shockingly, I was confronted by the very physical reality of depression and suicide. What began as a family outing of marvel and wonder brought me also to the darker side of reality as I noticed five or six emergency suicide hot line phones on the bridge, leading me to the conclusion that people in distress jumping off the bridge are such a problem that the stewards of the bridge felt like they needed virtual counselors available for the number of people with serious emotional issues that come to the bridge. Needless to say, I was dumbfounded at merely the sight of one phone, but the site of several brought the realization home just how discouraging and dark like can seem to at times, and how one can feel trapped. The Golden Gate in its number of suicide attempts is surpasses only by the Nanjing Yangtze River Bridge, with over a 1,600 body count. Most attempts are killed by impact trauma. 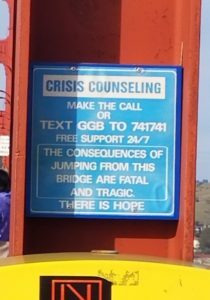 New suicides on the bridge occur about once every two weeks. t of things in life, sadness and irritability, and suicidal thinking, plans and attempts. According to 2015 data from the CDC, suicide is the 10th in line of causes of death in the US. I don’t know if this is a factual comparison, but close to 43,000 people die of suicide, and that’s about half the number of voters in swing states that voted for Trump over Clinton according to one news source. According to the American Foundation for Suicide Prevention, In 2014, white males accounted for 7 out of 10 suicides, and in fact, middle age, my age group, is statistically about on par with elderly adults, which is the highest percentage (19.3%). The statistics make me glad that some of my Facebook friends have circulated the reminder about wanting to remind people that someone cares and is listening. One of my pet peeves is forwarding something on Facebook based on someone else’s requests, but the reasonable requests are still reasonable even though there are manipulative forwarding requests. Depression and suicide prevention are good causes. Though I’ve never attempted suicide myself, the thought crossed my own mind just out of college because of my own demons, and I was so alarmed by it that I sought counseling. It’s easy to develop empathy for people in the midst of depression, because though I haven’t felt overwhelming depression symptoms for some time now, I can remember the fog-like state of being depressed and how I didn’t actually see a light at the end of the end of my tunnel, I had to try to hope there was one. I remember not long ago when Robin Williams committed suicide and how disappointed I was that the world had lost such a funny, seemingly kid man, and how he as a cultural icon had contributed so much to my childhood and life. Or, when Owen Wilson, who had also brought laughter, went through an attempt but received treatment for depression. Or, a close friend whose brother, also a friend of mine, took his life. Both my ow n experiences with depression and hearing about the misfortune of beloved friends or connected stories of via friends about depression and suicide are enough to serve as a clear reminder that we all need to be fellow “brother’s keepers” of one another and do what we can to help treat depression or prevent suicide. 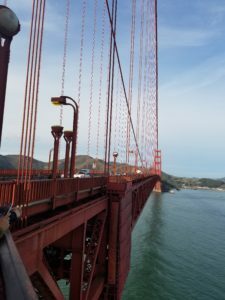 The hot lines on the bridge and the height above the water looking over were both strong reminders of how seriously the bridge patrol at Golden Gate takes depression and why it is so important to be vigilant about it. When I was very young, I might have joked and even mocked about suicide, and when I was experiencing severe depression myself, the thought of it frightened me because it had been considered. Now, being both a counselor who regularly encounters depression and someone who has partaken in its overwhelming fog, I empathize with those in its grip. To myself and others in my field, and others in the world who are aware of the need for all of us to be our brother’s and sister’s keepers: may our radar be strong and alert us when we encounter depressive episodes in others, and may we be among the front line in sharing empathy and helping guide them to the light at the end of the tunnel that they may not yet see. Being from the East Coast, I see the Golden Date Bridge as one of America’s icons. From the Golden Gate Bridge to extremely high bridges in the Appalachian Mountains to the Key Bridge only a few miles from my home. How many have been lost?